The Rev. 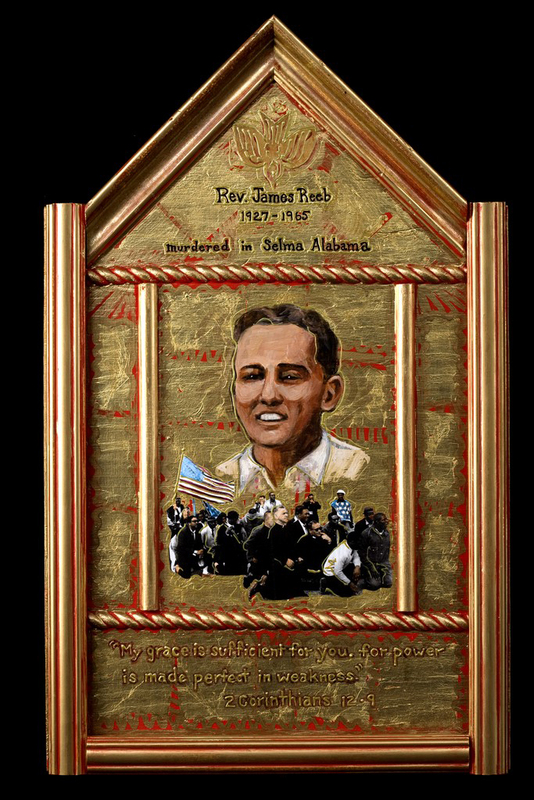 James Reeb was a Unitarian minister living in Boston with his wife and 4 children.He responded to Martin Luther King’s call to clergy from around the country to join the march from Selma to Montgomery. On his 1st night in Selma, Reeb was attacked by pipe wielding white men and died 2 days later. Born on New Year’s Day, 1927 in Wichita, Kansas, he felt called to the ministry before he finished high school. Graduating from Princeton Theological School, he began work among the poor in Washington, D. C. where he served as a minister at All Souls Unitarian Church.Then, he and his family moved to Boston where they bought a house in a predominantly black section of the city so that he could continue his commitment to civil rights. Reeb was a member of the Southern Christian Leadership Conference (SCLC).Following “Bloody Sunday” on March 7, in response to King’s request that white clergy come to Selma to support their black colleagues. He got on the next plane from Boston. Reeb was among hundreds who arrived in Selma on March 9 ready to march. They expected this to be a brief jubilant day of celebration, many planning to leave for home the next day. But a federal judge ordered the march postponed. King asked the clergy to remain a few more days. Reeb was among those who decided to stay.That night, after eating at a local black café, Reeb and 2 other ministers, Clarke Olsen and Orloff Miller, went in the wrong direction. Instead of heading toward their hotel, they found themselves in front of a notoriously roughwhite club. Four men came at them swinging pipes and clubs. All 3 were knocked down but Reeb was seriously injured. Lifted to his feet by his friends, he was taken to a local black clinic. The doctor told the men that Reeb needed to get to a hospital in Birmingham, but the hospital demanded cash payment. His friends began to collect the $150. When they finally arrived at the hospital, it was clear that Reeb had suffered a massive skull fracture. When James Reeb died 2 days later, there was a surge of national outrage, in sharp contrast to the official silence that accompanied Jimmie Lee Jackson’s death shortly before. “It’s a terrible thing to say, but it took the death of a white clergyman to turn things around,” one of his colleagues reminisced.Four days after Reeb died, President Lyndon Johnson presented a voting rights bill to Congress. Take his body, and cut it into little stars.